fabp38 7 months, 4 weeks ago. No donation link found for kyasu. 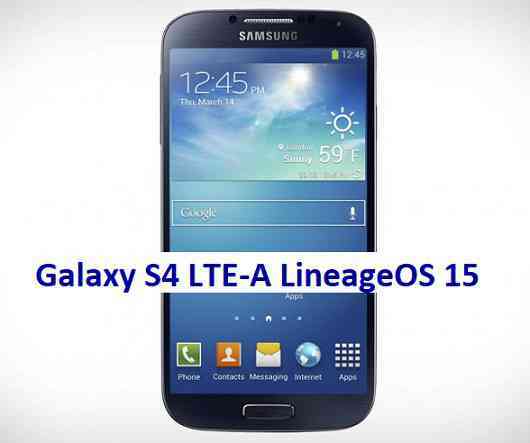 – LineageOS 16 for Galaxy S4 LTE-A is also available to download. THIS IS AN ALPHA ROM AND MAY HAVE MANY BUGS. HAVE A BACKUP BEFORE FLASHING THIS LINEAGEOS ROM AND TRY AT YOUR OWN RISK. Installing a custom ROM on a Galaxy S4 LTE Advanced (ks01ltexx) will delete all your data. Before proceeding further you may consider backup all data on the phone. You are the only person doing changes to your phone and I cannot be held responsible for the mistakes done by you. – Here is theTWRP update guide for the Galaxy S4 LTE Advanced (ks01ltexx). Download and Copy the Lineage OS 15.1 GApps and the Android Oreo based LineageOS 15.1 for Galaxy S4 LTE Advanced ROM ZIP file to your phone. First flash the Lineage OS 15.1 for Galaxy S4 LTE Advanced Oreo ROM ZIP from device. Then flash the GApps for LineageOS 15.1 zip from your device memory. Reboot and Enjoy the Oreo 8.1 LineageOS 15.1 ROM for Galaxy S4 LTE Advanced. Copy the latest Galaxy S4 LTE Advanced Lineage 15 Oreo ROM ZIP file to your phone. Stay tuned or Subscribe to the Galaxy S4 LTE Advanced LineageOS forum For other Android Oreo, Nougat ROMs, LineageOS 15.1 ROMs, other ROMs and all other device specific topics. Do I post bug reports here? I understand this is an APLHA, I’m just providing some help on bug reports. My service provider uses APN’s to allow connections to Mobile Data and I’ve found that Mobile Data doesn’t work in 2G, 3G or LTE modes. I am unsure whether it’s because Mobile Data itself isn’t working or if it’s the APN’s that aren’t working. Video record not working. I have tried both stock and google camera, still not working. Please fix these problem as fast as you can. See, I am a father of one and also being on a full time job, I get hardly any time to help you guys. Similarly, I am sure that every developer is also busy in their world. I just wanted to bring one thing to your attention that the developers are doing all this as a volunteer work and they are not at all getting paid for their work. Asking for ETAs (Estimated Time of Arrival) or requesting them to fix the problems as fast as they can does not really sound cool. I’ve tried to do a factory reset, it works, also just for the fist boot, next… still bootloops.. Anyone had this issue and found a solution to solve it ?